Make digital content and sites accessible to students with disabilities, in compliance with the Americans with Disabilities Act and other regulatory requirements, through design, professional training and instructional practices. Accessibility of digital content and websites is now a critical issue in education technology because online and blended programs in secondary and postsecondary classrooms have proliferated, and digital content has grown substantially. Students with visual, auditory, motor or cognitive impairments have the right to access this digital content and online instruction in an equally effective way as students without disabilities. Yet schools and colleges often have not made digital content and online instruction as accessible to these students as is required by law. According to the U.S. Department of Education, 13 percent of public school students and 11 percent of postsecondary students have disabilities. These students often need assistive technologies such as screen readers, braille, speech-to-text or navigation devices to access digital content — all of which are readily available. Federal and state laws require equal opportunity and equal access for everyone, regardless of disability. Section 504 and 508 of the Rehabilitation Act of 1973 and Title II and Title III of the Americans with Disabilities Act of 1990 regulate institutions and schools. Some states have their own laws as well. Most recently, the Every Student Succeeds Act and amendments to the Higher Education Opportunity Act have addressed the need for accessible content. They also stress the benefits of building accessibility into the design of instructional materials so they are functional for everyone, using a principle known as “universal design for learning.” In January 2017, the federal government adopted WCAG 2.0 Level AA as the official standard for Section 508 of the ADA, and federal agencies must comply with the standard by January 2018. 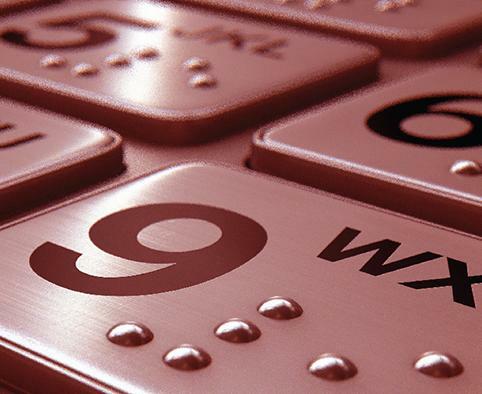 This standard for accessibility was developed by the World Wide Web Consortium (W3C) and is accepted internationally. Often faculty members create online course components without accounting for students with disabilities. When they are notified that they have a student with a disability enrolled in a class, they have to make last-minute modifications to course content, and their students are often short-changed with less-than-standard accommodations. 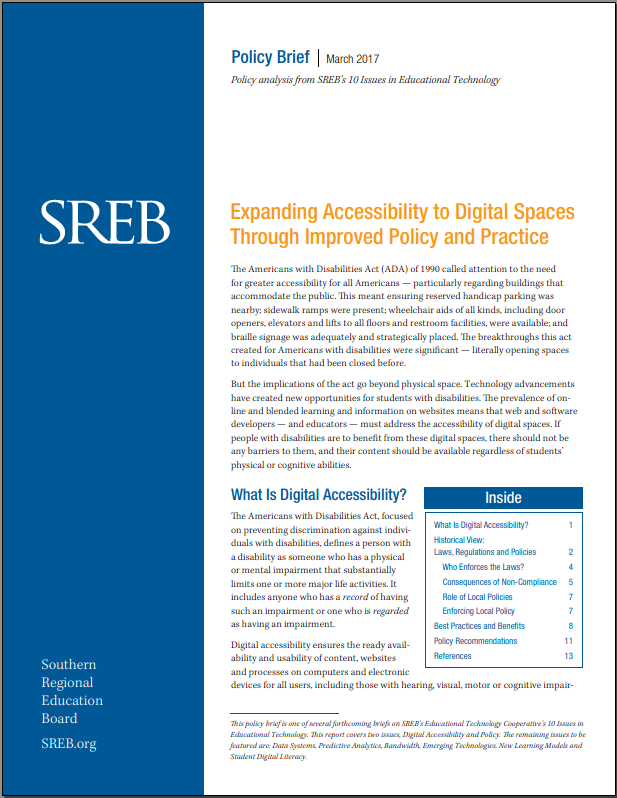 Federal policy and guidance directs educational leaders to address digital accessibility at every opportunity, but too many institutions do not make their digital content and websites accessible. When they deny students with disabilities equal access under the law, they risk law suits from the Department of Justice or the Department of Education, Office of Civil Rights. Students, disability organizations (such as the National Federation for the Blind), and individual citizens can file complaints and the responsible federal agencies are required to investigate. While federal laws clearly indicate that educational entities are responsible for the accessibility of the materials they purchase, many publishers and other vendors have not produced fully supportive accessible materials. Faculty who are not alert often purchase inappropriate materials for use online without regard to applicable accessibility laws. To overcome this shortcoming, SREB states need accessibility training, legal compliance awareness, improved communication, clarification on purchasing policy, and vendor and technology support. Accessible content and universal design benefit not just disabled students but all learners, especially English language learners and students with different learning styles. Educational agencies, schools and institutions need to have a comprehensive accessibility plan. These plans should include acceptable practices, a communication plan, training, and an evaluation process to ensure that policies are followed. Agencies should use purchasing contract language that requires a voluntary product accessibility statement and that addresses the consequences for the vendor if materials and services purchased are not accessible. Accessible content and universal design for learning benefit not just disabled students but all learners, especially English language learners and students with different learning styles or learning disabilities. Accessible content is both a legal and an ethical obligation. Making online content accessible for students with disabilities is not easy, but it is the law. As deficiencies have resulted in lawsuits and costly resolutions, more-specific legislation has emphasized that all students need greater access to digital resources. This policy brief reviews the legal landscape and offers recommendations for how states, state agencies, colleges and schools can comply with federal and state disability laws.